Do you have the luck of the fairies on your side? Find out with this unique progressive jackpot pokies game from Microgaming, an enchanting slot that offers the potential for some huge payouts, with plenty of fun bonus features along the way. Find out more about Lucky Fairy and where to play for AUD at the best online casinos. Lucky Fairy uses a magical theme full of sparkles and stars, with reels set against the backdrop of an enchanted forest. While this is a more feminine game suited to players who like their slots with a side of softness and fantasy, the addition of a progressive jackpot prize pool means players of all kinds will find value in Lucky Fairy. There are multiple unique bonus features, including Lucky Fairy Upgrades, Fairy Bonus Trail and a Jackpot Chance Wheel which offers a new spin on progressive jackpot bonuses. Not a visually impressive game by any means, but the winning potential makes Lucky Fairy worth a try. 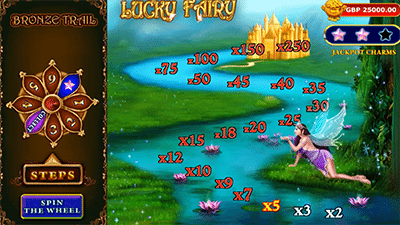 Lucky Fairy is an instant-play game that can be played directly over your Web browser with no downloads required. As a progressive jackpot game, real money bets are required to play, so you will need to sign up for an account with a trusted online casino to access this game. Refer to the casino table above for a full list of the best Microgaming slot sites that offer some great bonuses for new players. Lucky Fairy has 20 fixed paylines, so all you need to do to play is select the size of your wager which will be split equally between all 20 lines. Minimum bets start at $0.20, with maximum bets capped at $40.00 per spin. Wild symbol – The Lucky Fairy logo is wild and substitutes for all other symbols to form a winning combination except the scatter symbol. Scatter symbol – The scatter is the star Bonus symbol which can appear anywhere on reels two, three or four and turn into a wild symbol when substituting on any winning combination. When acting as a wild, the scatter can substitute for all other symbols to form a winning combination. Lucky Fairy Upgrades – The Lucky Fairy herself can appear at random after any spin to wave her magic wand and upgrade some of the symbols to higher paying symbols. The Lucky Fairy can upgrade up to 15 symbols on the screen, excluding scatters and wilds. Fairy Trail Bonus – An appearance of three or more Bonus symbols across reels two, three and four triggers the Fairy Trail Bonus, an exciting bonus game that replaces the typical free spins feature. In the Fairy Trail Bonus, you are taken to a separate screen which features a magical fairy tale land. Spin the wheel to the side of the screen to move the Lucky Fairy closer towards the Golden Palace, with each spin determining the number of steps she will take. Continue to spin the wheel until you land on ‘Collect’ which will end the bonus game. Your prize will be your current position on the trail multiplied by your total stake. The Fairy Trail Bonus starts in Bronze mode, but at any time the fairy may blow magic dust across the screen to turn it into Silver or Gold mode, with higher winnings available for each. The current amount of the progressive jackpot is displayed in the pot of gold coins presented at the top of the game screen at all times. A portion of all real money bets placed on Lucky Fairy in the shared Microgaming progressive network goes towards boosting the amount of this jackpot. 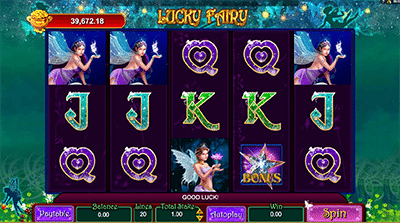 Without the addition of the jackpot wheel and the bonus games, Lucky Fairy would be one to avoid. The graphics are just so outdated it’s hard to imagine what Microgaming are thinking, as we know this game studio is capable of so much more. But progressive jackpots are always popular, and Lucky Fairy does hold some good winning potential, so if you can see past the sub-par graphics, this could provide some entertaining gameplay. Play Lucky Fairy and hundreds of other Microgaming pokies at House of Jack Casino, where new players can take advantage of up to $450 in bonus money and 100 free spins to use on selected games.